1. How is the Therapy Dogs Singapore (TDS) programme different from those of other voluntary organizations? 2. What happens at a pet therapy session? Each pet therapy session would see volunteers and their dogs greeting the patients, and using the dogs to help break the ice in starting a conversation. Simple Animal Assisted Activities (AAA) would include putting small dogs onto the laps of patients to be stroked and getting larger dogs to "feet up" onto patients to be patted. It may also include getting the dogs to perform tricks to entertain the patients, or getting patients to give the dogs little treats. Animal Assisted Therapy (AAT) activities may be tailored to help specific patients achieve desired benefits, including walking the dogs, throwing dumbbells of different weights and sizes, and brushing the dogs' fur. 3. 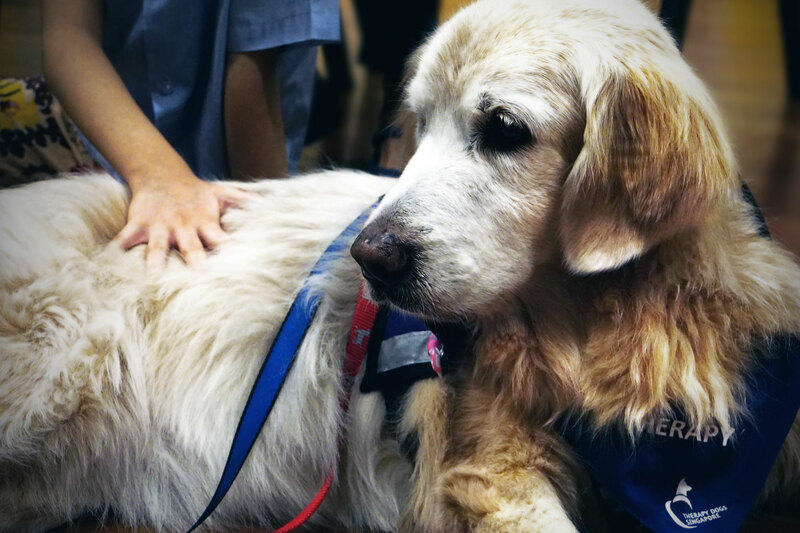 What do therapy dogs actually do? Therapy dog activities vary from simply snuggling to a patient/resident and offering a warm furry body for patting to more advanced skills such as walking and playing specific games with them. All these are designed to cover AAA and AAT activities. Please refer to our website for explanation of AAA and AAT activities. 4. What makes a good human volunteer? 5. Can I volunteer with my family? 6. What kind of commitment is required? TDS' expectation is for all volunteers to commit to at least 4 visits in 6 months, to at least 1 specific institution. Each visit will last for 1 hour. 7. Can I participate even if I do not have a dog? TDS welcomes volunteers who do not have dogs. You must be comfortable with large and small dogs, and be able to help handle one if required. We also welcome those with special skills that can help promote the cause of TDS. Please contact the TDS administrator for further information. 8. Do I get paid as a volunteer? 9. How do I become TDS volunteer? Please complete the online application form. It can be found in the Join TDS page. 10. What makes a good therapy dog? 11. I have a small dog, is it suitable for PAT work? Yes, all dogs, whether, small or large, are suitable for PAT work. In fact, we encourage owners with small dogs to join TDS because owners can bring their dogs to the residents' beds or let the dog sit on the residents' laps. 12. My puppy is only 6 months old. Can we join TDS? 13. Why is there a need for TDS to conduct temperament assessment? 14. Must I pay to have my dog assessed? Our assessments are conducted by our volunteers free of charge.